The Whippets took on two teams on Tuesday, January 8th winning the dual meet against Platteville/Lancaster and losing to Lake Geneva Badger. Successes against Badger include a first place finish in the 200 Medley Relay (Aidan Coburn, Young Liang, Devin Bazeley and Jack Mayer), Young Liang finishing first in the 50 and 100 Freestyle, Devin Bazeley winning the 500 Freestyle and the Relay team of Young Liang, Shawn Chan, Devin Bazeley and Jack Mayer pulling off the win. Adding times to the Top 10 Times list were Jack Mayer in the 200 Individual Medley and Young Liang in the 50 Freestyle. Big time drops came from Jon Chan in the 200 IM (-15 sec), Zach Tomomitsu in the 100 Freestyle (-11 sec), Antonio Aranda in the 500 Freestyle (-28 seconds), Jovany Manriquez in the 100 Backstroke (-27 sec), Wesley Salverson in the 100 Breaststroke (-4 sec) and Shawn Chan in the 100 Breaststroke (-6 seconds.) 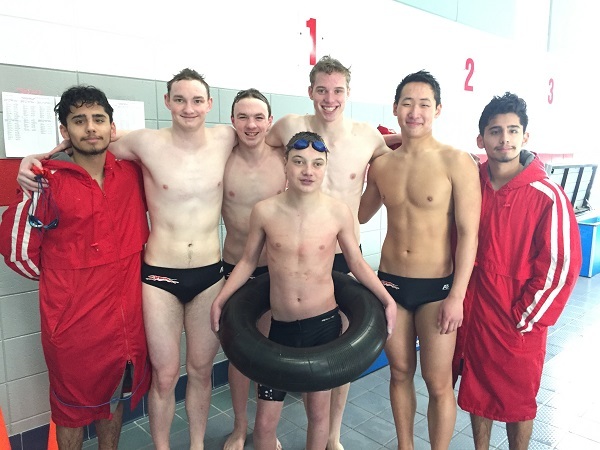 Other best times include Jack Mayer and Antonio Aranda in the 200 IM, Young Liang and Jonathan Manriquez in the 50 Freestyle and Jovany Manriquez in the 100 Butterfly.